We've had a couple of people ask us recently about becoming repair technicians. What does it take to get started? Is this something you train to do? We sat down with Powell's Repair Technician, Rachel Baker, to see how she got started. Rachel told us that when she was in high school, she was thinking about her career. She was active in her music program as an instrumentalist and wanted to continue with music. However, teaching wasn't something that she thought would be a good match, and she felt that the performance world was a bit too competitive for her. 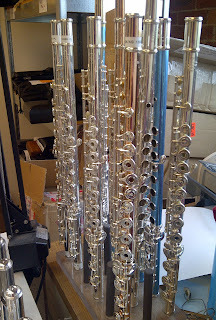 As she contemplated some other possibilities, she thought, "Well, I send my flute out to get repaired, so what can't I do this with instruments, too?" She told us that she likes working with her hands and solving problems, so this seemed to be a perfect match. In her junior year of high school, she went to work for her local music store. She began by cleaning rental instruments and was eventually able to apprentice with one of the repair technicians at the store. 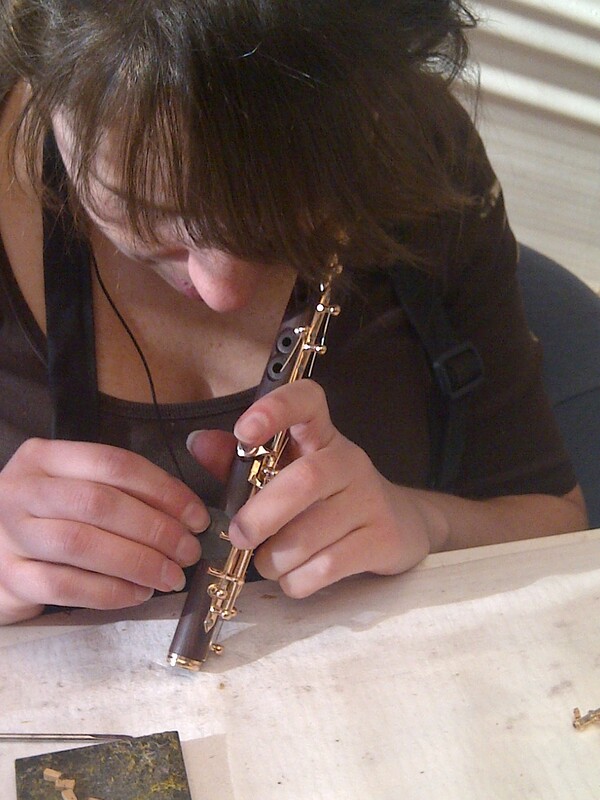 Her training in repair started by repadding alto saxophones. 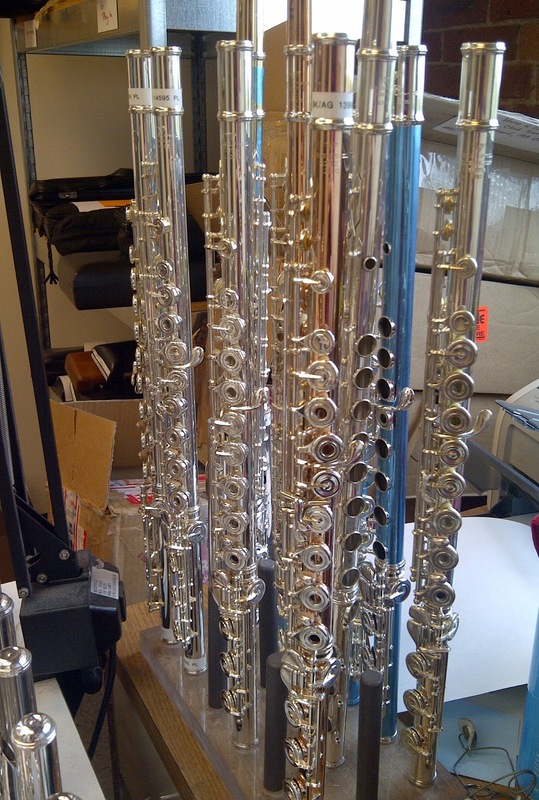 She said that alto saxophones have "a little bit of everything -- clarinet-type pads, flute-type adjustments, " so it was a good place to start. After high school, she chose to enroll in a repair school program at Western Iowa Tech and received her Associate's Degree in Applied Sciences in Band Instrument Repair. Rachel emphasized that attending repair school is very important, especially in current times when apprenticeships are very rare. She mentioned a few others programs in Minnesota, Washington, and Wisconsin -- and we happened to find a comparison chart of these programs at http://www.probirt.com/nm/repair-schools/repair-schools.asp. 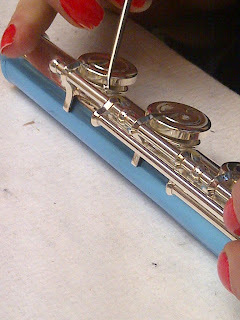 Additional information may be found on the NAPBIRT (National Association of Professional Band Instrument Repair Technicians) website at http://www.napbirt.org/repair-schools---. Rachel mentioned that it is important to research the repair school programs and find out as much as possible. She says, "it may not be for everyone..." In her class of 10, she said that she might be the only one still doing repair -- so it is truly important to investigate before you commit to a program. During her studies in Iowa, Rachel worked at her hometown's local music store during holiday breaks and vacations. When she completed her studies, she returned to work at the shop full-time. There were 3 repair technicians (including Rachel), which she found quite helpful. She said that as for the repair techs, "everyone did everything, and you could ask people for help." To be a repair technician, Rachel also mentioned that it is helpful if you can play different instruments. Rachel played trumpet and sousaphone in her high school marching band, oboe in her high school concert band and orchestra, and flute in private lessons and concert band. She added that while in college, she also played in a bassoon quartet. She has played single reed instruments as well but told us that she prefers "double reeds and no reeds." Sounds fair enough! In addition to her formal studies and training at the local music shop, she says that when it comes to repair, you also learn over time. She feels that it is important to listen to your customers, because it makes you more aware of what may need to be adjusted and how the instrument should function properly for each individual. When it comes to pro models, she says that people have specialized concerns -- which is why the customer is so critical in the process. As she said so eloquently at the end of our conversation, "you never stop learning..."